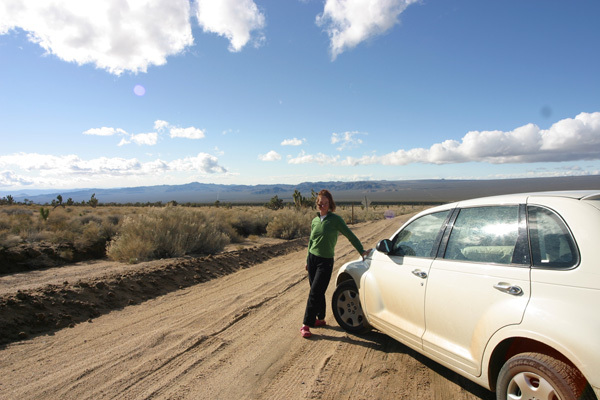 As the greatest journeys often do, our 5 week Californian road-trip back in 2008 pretty much planned itself. With friends, family, must-sees and must-dos dotted across the golden state, all we really had to do was to follow the dots. Flying into LA, we kicked the trip off staying with one of my closest friends, who was living halfway between Topanga Canyon and Malibu with her husband and young son. Good food, good wine, good company and a hot-tub on the deck. What more could you ask? Well, I guess if you were being greedy you could also request proximity to great surf beaches, extensive hiking trails and one of the most exciting cities in the world. Well, would you look at that? Tick, tick, tick. After a heady few days in and around the smog of LA we headed out to the national park at Joshua Tree. The desert landscape there is almost other-worldly in its strange, harsh beauty and it’s home to some awesome climbing, as well as lots of wildlife. 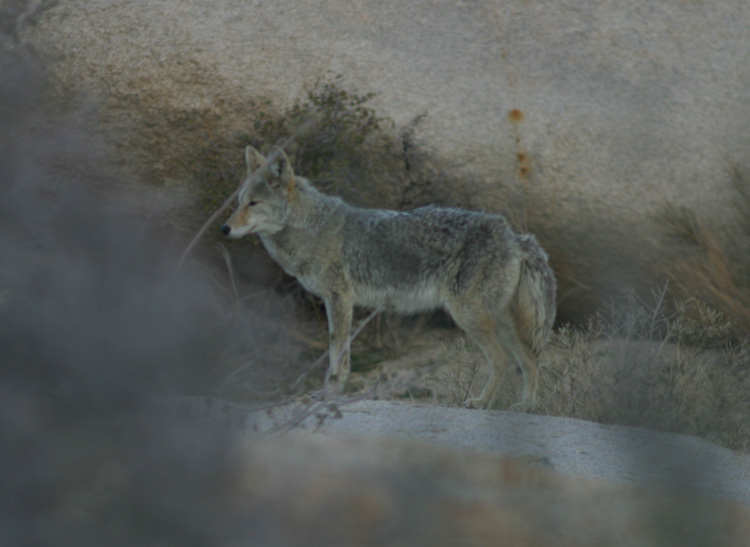 We saw several coyotes during our stay and even a bobcat stalking right through our campground. Yikes! We had timed our visit for the end of January and into February so that temperatures wouldn’t be too high for climbing (plus flights are at their cheapest then in the post-Christmas lull). The Californian winter didn’t let us down – the desert days were perfect with clear blue skies but not so sweltering as to be sloth (or sweat) inducing. 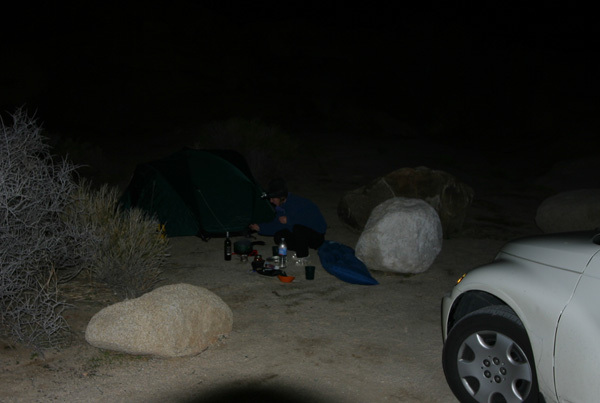 Our ‘cosy’ campsite, hewn from the granite of J-Tree. The night skies were so bright that we didn’t even have to use our headtorches most of the time. Richie’s birthday fell while we were at Joshua Tree and we celebrated by driving to Twentynine Palms for the evening and relaxing our cold and worked muscles in hot springs under the vast canopy of the night sky. Bliss. Despite this indulgent interlude, after several days of the privations of desert camping we were ready for some full-on modern comforts – and where better for full-on indulgence than Vegas, baby! 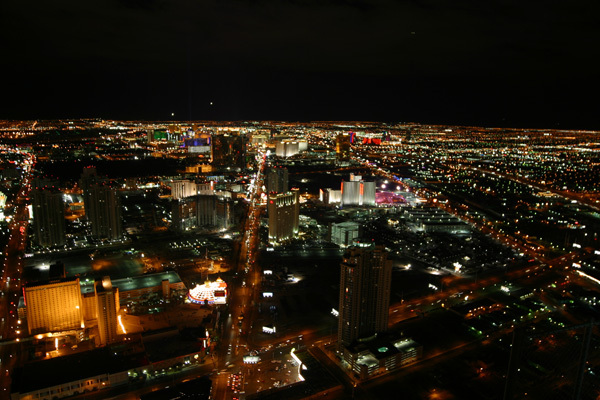 The view from the top of the Stratosphere, Las Vegas, where we rode the aptly named Skyjump and Insanity. I feel a little queasy just writing this. Luckily, we discovered that it is perfectly possible to do extravagant Vegas on a shoestring – just be sure and STAY AWAY FROM THE BLACKJACK. You can get great deals on rooms because the casinos are so sure you’re going to lose all your money at the tables, plus they’ll comp you cocktails all night long (or day if you’d rather – normal hours don’t necessarily apply here). The all-you-can-eat buffets may vary in quality and price but you certainly need never go hungry. After two days of sensory over-stimulation (broken up by some climbing at nearby Red Rocks) we managed to quit Vegas and Nevada and return over the state line to California, with our wallets and sanity still relatively intact. Here we are on an exploratory detour. I was slightly concerned at this point that we might never reach civilization or paved roads again. Also, if you look closely you can just make out our surfboards squeezed into our little hire car. That got us some strange looks in the desert. Bishop is a gorgeously typical small western town with a Main Street you feel like you’ve driven down before, even on your first visit. 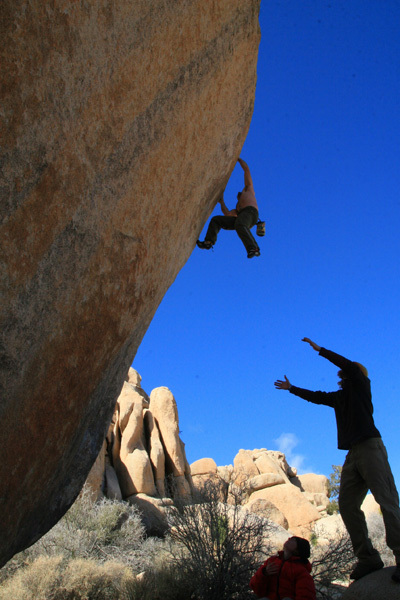 It’s got excellent skiing nearby as well as some world class bouldering and climbing. For me it was a first visit and a chance to meet Richie’s friends Wills and Lisa, who kindly put us up and showed us around the whimsically named Happy and Sad Boulders and the spectacular Buttermilks. To reach our next destination, San Francisco, we would have to cross back west over the Sierra Nevada and this was to prove more challenging than we realised. It being February, the mountains were naturally living up to their snowy name. Many of the mountain passes in this range are simply closed for months throughout every winter and even more roads were closed on the day we travelled, owing to a particularly big snow storm brewing. Roadside signs had been warning of the impending storm for days but we thought we would make it across the interstate from Reno just in time. Unfortunately we had severely underestimated the scale of the storm that was about to hit and of the crossing that we had to do. As we hurriedly scuttled north from Bishop to Reno, naiively hoping to outrun the brunt of the storm, our first near-disaster struck when we got pulled over for speeding by a state trooper. With his reflective aviator shades and humourless questioning he was a tad intimidating. But then he suddenly softened and to our complete astonishment told us he wasn’t going to ticket us and that Richie could count it as a belated birthday present! (Believe me, this would NEVER happen in Spain.) He must have felt sorry for the tourist idiots in their ditsy, impractical PT Cruiser, laden down with surfboards and heading for the eye of a blizzard. Eventually, we made it to Reno as the first snow flurries started. By this stage it was obvious that we needed to buy chains (what now? and how exactly do you put those on?) before venturing anywhere near the interstate. Richie chose this moment to regale me with stories of the first pioneers to make this same crossing here at Donner Pass – of how they were stranded for months in the snow and how they eventually resorted to cannibalism. Nice. Thus it was that with chains clanking in our trembling hands we paid the toll-booth operator and took our chances ticket at the entrance to the I80 interstate. ‘You need to pull over right there and put your chains on your vehicle now,’ he told us. And then he wished us luck for the journey. I had a feeling we were going to need it. Oh yes, indeed we did….and I couldn’t agree more with you. Santa Cruz was just amazing – heavenly. Ocean Beach wasn’t really working when we were there, which was a shame, especially as we were staying just a few blocks from there but still, there’s plenty of other stuff to entertain one in San Francisco! Ocean beach is very fickle and wind-sensitive, but when good one of the best beach breaks in the US. Worth a look if you return. That’s good to know. It was totally blown out when we were there and I must say the paddle out looked pretty scary. The day we were leaving SF we drove past and there was a lone surfer in the water being towed in on a jet-ski! Really great post! Loved seeing some of our old stomping grounds through a visitor’s eye. We spent a lovely weekend at 29 Palms (pre-kids). Did you happen to see any of the Salton Sea? It’s kind of a sketchy area but it is quite a sight. The NYT did an amazing photoblog on it, if you are interested. Thanks Erin – very much appreciated. And thanks for reminding me about the Salton Sea. How could I have forgotten that?! It really is an amazing sight, plus I seem to recall being rather worried about the possibility of exploding meth labs. You certainly wouldn’t want your car to break down out there. I’ll definitely check out the NYT photoblog – sadly, we lost nearly all our photos from the trip on a hard drive that got dropped. Doh! So sad you lost the photos but what you have here are brilliant. Looking forward to Part 2! Amazing photos. You’ve just brought back some great memories too, thank you! I’m really glad you enjoyed it. Thanks for reading! Thank you for the lovely mention! And now it’s my turn to apologise (not that you ever needed to! ), I am gradually catching up after my trip home! It’s funny you should say that but one of the highlights of the trip for us was when an actual, live roadrunner ran across the road in front of us when we were driving on the outskirts of some new town in the middle of the desert! We did such a double take it was comical – could have gone home happy right then!